Brand New Compatible Makita 12V Battery Replacement, Highest Capacity. Pod Style (Brand New Battery; High Quality Grade A Cells) 12 volts 3000 mAh, NIMH. Use with Makita 12V Cordless Tools. Use with original Charger. Mix/Match for Extra 5-10% OFF! Out of 26 Product Reviews for this Makita 12V Battery Replacement, the overall rating was 4.77/5 Stars and some of the reviews included detailed comments (see below). 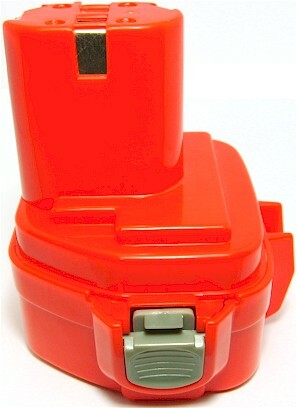 This is a brand new replacement battery for Makita's MAK-1222 battery (see compatible model list below). This Makita 12V Battery Replacement is an Extended Life battery packed with 131% more power than the original. 100% OEM Compatible. This aftermarket Makita 12V Battery Replacement is guaranteed to meet or exceed OEM specifications. Your new Makita 12V Battery Replacement comes in a discharged condition and must be charged before use (refer to your manual for charging instructions). The Makita 12V Battery Replacement prefers a partial rather than a full discharge. Frequent full discharges should be avoided when possible. Keep the Makita 12V Battery Replacement cool and store only in a cool, dry location. The Makita 12V Battery Replacement is Quality Tested and RoHS & CE Certified. Should I charge my battery each time I use it? What will cause my battery to lose power? Does the battery come with installation instructions? Does the battery come with a tool kit to help me install it? My new battery isn't charging; is it defective? Does my battery self discharge when not in use? I just received my new battery, why isn't it working? Will my device's performance differ if I use your aftermarket battery? Will the battery fit my device? I do not see my model listed in your Compatible Model List? Will your battery fit? We do our best to list as many models that our batteries fit, but inevitably we sometimes miss a model or two. The best thing to do to insure that our compatible Makita 12V Battery Replacement will fit in this case is to ask us. Copyright © 2019 BatteryShip Inc. All rights reserved. All offers and prices are subject to change without notice. All brand names and trademarks are the property of their respective owners. The listed brand names and model designations are intended only to show the compatibility of these products with various machines. Neither BatteryShip Inc nor BatteryShip.com are affiliated with the original manufacturers of any of these batteries or chargers. All products on this page are generic, aftermarket, replacement parts.